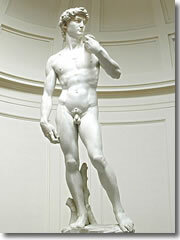 Here is an itinerary that takes in all the best of Rome, Florence, and Venice in just a week. In fact, since the logistics of air travel often force you to fly home from Milan, we've gone ahead and worked in half a day to see its highlights as well. Tall order? Yes. But do-able. Don't forget to pay attention to the "Before you Leave Home " tip at the end of the itinerary covering all the details you need to take care of before leaving home—and be sure to read the "Foolish Assumptions" page about how these itineraries are meant to work and how to tweak them to fit your own schedule. Buon viaggio! MORNING: Most transatlantic flights land in Rome in the early morning (around 8am), and by the time you collect your bags, go through customs/immigration, get downtown, and check into your hotel, it'll by 11am—plenty of time to check in, splash your face, and head out for an afternoon of sightseeing. Now I know the first day can be rough, what with jet lag and the fact that you probably didn't sleep well on the plane, so today, though it seems packed with activity, is really not all that taxing. It's mostly just poking around the greatest churches of the Tiber Bend, the center of the old city (plus one small museum). Plan to spend only about 10–15 minutes inside each church—give yourself permission just to look at the highlights and not to try and appreciate every altarpiece and architectural element—and you will keep on schedule and not feel too overwhelmed. Piazza Navona.Sitting down to a leisurely lunch will only exacerbate the jet lag, so just grab a quick bite en route to Rome's prettiest square, the gracious, fountain-studded, cafe-lined Piazza Navona. Pop out of the north end of the piazza to see the church of Sant'Agostino (works by Caravaggio and Raphael inside), then head south past San Luigi dei Francesi (more great Caravaggios) to the courtyard hiding the curly-cue dome atop Sant'Ivo alla Sapienza. Walk through the courtyard, past the church, and out the east side of the building to Piazza Sant'Eustachio, home to the most famous cappuccino in Rome at the Caffé Sant'Eustachio. Don’t linger too long, or the jet lag will start to catch up with you (an extra cappuccino or two helps). You can do this (or any) itinerary backwards—starting in Venice. Just keep in mind when Monday falls and many museums will be closed. 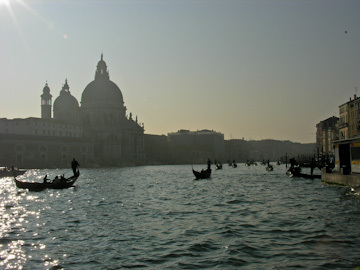 If you do as most people do and fly over there on a Friday night (arriving Saturday morning), it'd be best to spend that first half-Saturday just as detailed for Day 6 in Venice (Grand Canal, Accademia Gallery, gondola ride). Then spend Sunday doing the Day 7 activities (St. Mark's Cathedral, Doge's Palace) though since the cathedral is closed to non-worshipper in the morning, you'll have to hit the Palazzo Ducale first on the 9:55am tour, followed by the bell tower, clock tower and lunch all while waiting for San Marco to open at 2pm. 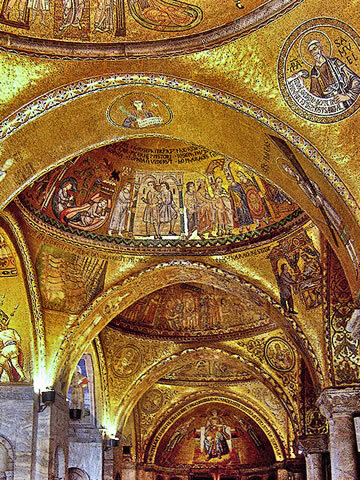 However, you also get a bonus: by being in Venice on a Sunday, you have a chance to attend the cathedral's 6:45pm mass, the only time they illuminate all those amazing mosaics. Save Monday for your day touring the outlying islands of Murano, Burano, and Torcello, where all the sights are open MondaysJust a bit farther east is the noble Pantheon, the only ancient Roman temple to survive the millennia virtually intact and one of the best sights in all of Rome (if you skip everything else on this day, at least see the Pantheon). Head north, past the baroque optical illusions in the church of Sant'Ignazio and the ancient Roman Column of Marcus Aurelius on your way to grab the 116 minibus to the Porta Pinciana (you'll see a park across the street; it's called the Villa Borghese). Enter the park and take the first path on your right (Viale di Museo Borghese) to get to the Galleria Borghese by 3pm (TIP: you will need to purchase tickets in advance for this, or sign up for a 3pm tour; see the "Before You Leave" sidebar at the end of this itinerary). Tour its collections of amazing early Bernini sculptures and Raphael and Caravaggio paintings until the museum closes at 5pm. The evening passeggiata along Via del Corso.Make your way through the Villa Borghese park to the top of the lively Spanish Steps. 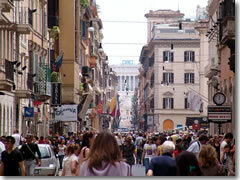 Mingle for a while, then window shop down fashionable Via dei Condotti and the surrounding streets. If you make it all the way north to Piazza del Popolo before the fabulous church of Santa Maria del Popolo at the far end of the square closes (works by Raphael, Caravaggio, and Bernini inside), so much the better. By the time you get to the Corso, one of Rome's main drags, the evening passeggiata see-and-be-seen stroll will be in full swing and you can strut your stuff with the Romans until it's time for a hearty and well-deserved dinner in the Old City. 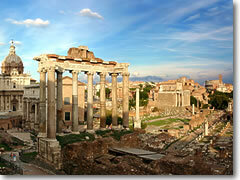 • Capitoline Museums and Origins of Rome Walking TourMORNING: Rome's all about Caesars, right? Start off day two in Rome by crawling around the ruins of the Roman Forum, where, two millennia ago, great orators held forth, senators debated, and Julius Caesar strode the streets. Unfortunately, little is left to see in this dusty jumble of foundations, arches, and standing columns—and much left to the imagination. But so much the better, as this way you can be out by 11:30 and on your way to see Michelangelo's Moses in the church of San Pietro in Vincoli before it closes at 12:30pm. AFTERNOON: After lunch (the old-school wine bar Cavour 313 is conveniently located nearby), pay a visit to the Colosseum. Take 45 minutes to wander around inside this amazing ancient amphitheater (save time in the often long lines by booking your entry ahead). Today we spend on the other side of the river from the bulk of old Rome. Be up bright and early (I know, you never seem to get to sleep in) so that you beat the legions of tour buses to the Vatican Museums, which open at 9am. Early risers who want to cram more in can visit St. Peter's first—it opens at 7am—spend 90 min. there, then walk around the Vatican walls to tour the Vatican Museums when they open at 9am. This'll free up more time later for Castel Sant'Angelo and some sights in Trastevere.They shoo you out in early afternoon, so grab a snack on your way around the Vatican walls to visit the grandiose church of St. Peter's. See Michelangelo's Pietà and tour the tombs of popes under the basilica before climbing its dome for a panoramic sweep of the city across the river. Afterwards make your way back across the Tiber River to the famous Trevi Fountain, into which it's tradition to toss a few coins in order to ensure that, one day, you'll return to the Eternal City. 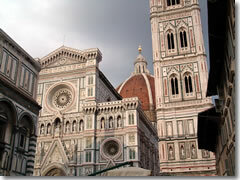 MORNING: Take the earliest train you can manage to Florence (about a 90-minute ride) and drop your bags by the hotel. MORNING: There's an 8:37am train from Florence that pulls into Venice around 11:30am so you can dive into the city of canals (not literally). AFTERNOON: Have a snack on your way to check into your hotel in the early afternoon, then spend the mid-afternoon perusing the Renaissance masterpieces in Venice's Accademia Gallery (yes, it has same name as a museum in Florence; this is because both are part of their city's "Academy" of Fine Arts). Take a gondola ride before dinner (yeah, it's a bit cheesy—and expensive—but you wouldn't want to have come all this way and not done it, either), and wander the quiet, romantic streets a while after your meal. • Private Tour: Murano, Burano and Torcello Half-Day Tour MORNING: In the morning, head straight to one of Europe's prettiest squares, the canalside Piazza San Marco. Wander the glittering mosaicked wonderland of its Byzantine San Marco cathedral and ride the elevator up the bell tower for a sweeping view across the city and its canals. AFTERNOON: Spend the afternoon however you’d like: shopping for Venice's famous glass trinkets, popping into more museums (my votes: the Peggy Guggenheim of 20th century art and the Ca' d'Oro, the grandest of the Renaissance palazzi along the Grand Canal) and churches, or simply have fun getting lost in the twisting, confounding, unspeakably beautiful back streets of Venice. If any of your days in Venice happens to be a Sunday, do not miss the 6:45pm mass in the Cathedral of St. Mark's—the only time they throw on all the light switches to illuminate all of those amazing gold mosaics.Another option (and my personal favorite): take off on a ferry for the outlying islands of Murano, where the glass industry started and a bit like a Venice in miniature, and Burano, a fishing village of riotously colored houses along miniature canals. It’s about an hour's ride out and back, and you should spend about an hour on each island. • Milan Brera Museum Walking Tour Note: If you plan to fly home from Venice, I suggest you spend the afternon of Day 7 (yesterday) just bumming around, doing whatever you'd like, then take Day 8 (today) to do an all-day tour of Venice's Outlying Islands. 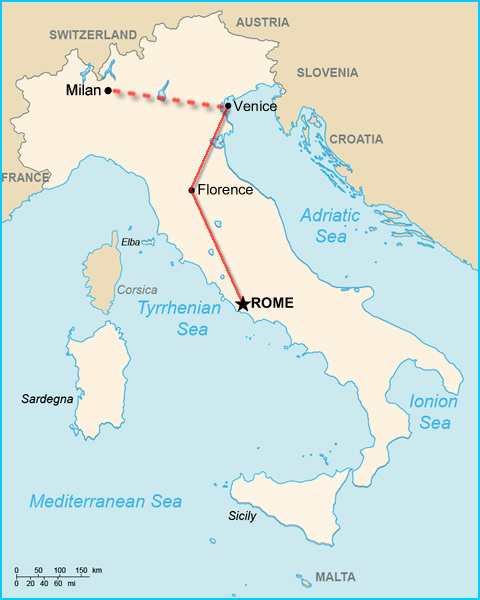 However, this itinerary will continue on to Milan because for most people, flight schedules mean it makes far more sense to fly home from Milan (and staying in Venice for Day 8 then trying to get to Milan on the final day early enough to catch your flight is tricky at best). MORNING: Catch the train to Milan (2.5–3 hrs)—I recommend making the 8:50am train from Venice at the latest, so as to give yourself a good long stint in Milan. Drop your bags at your hotel and make your way to the heart of the city, Piazza Duomo, to grab a light lunch. Two suggestions: either at a cafe table with a peek-a-boo view of the cathedral facace from under the soaring glass cilings of the famed 19th century shopping mall Galleria Vittorio Emanuele II, or a panzerotto (Milanese empanada) to-go from Luini just around the corner. AFTERNOON: After your quick lunch (try to finish by 1pm), check out the magnificent Duomo—its statue-studded facade, wander the forest of columns inside, and climb up onto the roof to duck under flying buttresses and step around spires to a thrilling panoramaic view. By 2pm, head to the Metro to ride the M1 one stop north to Montenapoleone and walk up to the Pinacoteca di Brera, Milan's premier painting gallery, home to masterpieces by Caravaggio, Rapheel, Bellini, and Mantegna. Leave the Brera by 4pm and stroll west to Milan's sprawling Castello Sforzesco, a castle complex installed with fantastic museums that house, among other things, Michelangelo's last sculpture, the unfinished but strikingly modern Rondanini Pietà. 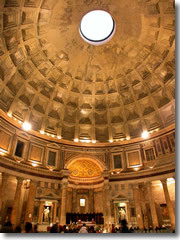 Leave the Castello by 5:30pm to make your way southwest to Corso Magenta and your at 6:15pm date with the Last Supper. It is essential to book tickets in advance to see Leonardo da Vinci's Last Supper. You must do this—I am not kidding—several weeks in advance—months, preferably—as there is a limited number of tickets for each entry time, and they really do sell out way, way in advance. Booking them as far in advance as humanly possible will also ensure that you get the entry time you want (6:15pm or 6:30pm). If you end up stuck with a different, earlier entry time, just rearrange today's schedule to accommodate. Seeing the fresco only takes about 20 minutes, but it's well worth it. Even if you are not usually an opera fan, why not end the trip with one of the cultural highlights of Italy: an evening at La Scala, one of the world's most renowned opera houses? You can get tickets last-minute, but on such a tight scheudle just go ahead and book them well in advance (you'll get better seats, too). Most operas start at 8pm (some at 7:30pm; a rare few at 6pm, so you would have to skip the Castello or the Brera and move up your Last Supper time), so fortify your stomach before the show by nibbling on free aperitivi appetizers laid out at many bars in the historic center. After the show, have a late—and well deserved—last supper in Italy of your own in the trendy Navilgi district of canals at the southern edge of the center. ALL DAY: Most flights back to the U.S. leave either in the morning or early afternoon. Either way, the day's largely a wash. You'll spend all morning getting to the airport and the rest of the day in the air. Hopefully, you are able to book a flight home leaving from the Venice-Marco Polo airport, which does have a few direct flights to JFK, though most will stop/change in some other big city first. If not, you will have to fly home from Milan, so be sure build in 3 hours for the train ride there from Venice (the ride actually only takes 2:35–2:45, but it's always wise to build in an extra cushion of time). Sadly, this means catching a ridiculously early train—like 6:20am. That's it! I hope you had a great trip. Try to catch up on your trip journal on the plane—oh, and be sure to grab some good plane snacks before you head to the airport (foccaccia's my favorite)—Italian food beats airline food any day of the week. A tall order for just one week? You bet. But there are two tricks to fitting all you can into such a short time here.